Best-known as an actor, Joel Edgerton directed his first feature with 2015’s The Gift. 2018’s Boy Erased acts as Edgerton’s second stint behind the camera. Based on Garrard Conley’s memoir, Erased introduces us to Jared Eamons (Lucas Hedges), the teenage son of Marshall (Russell Crowe) and Nancy (Nicole Kidman). A deeply religious Baptist family, fissures emerge when Jared comes out as gay. To “fix” this so-called problem, Jared goes to “Love in Action”, a faith-based program that attempts to turn homosexuals into heterosexuals. This leads Jared on a path of self-discovery and acceptance. Despite the inherent power of the basic story, Erased seems oddly detached and dull. The synopsis makes it sound a lot more dramatic and involving than it actually is. Oh, the film musters the occasional scene of actual drama, but most of it plods along in a slow, bland manner that never really seems to invest in the subject matter. We get a vague sense of the characters and what they go through but we don't feel connected or all that concerned. Some of the issue stems from Hedges' strangely flat lead performance. So good in Manchester By the Sea, Hedges comes across as vaguely earnest here but he never manages to bring out internal life in his character, so we find ourselves left at arm's length from him. Perhaps the problem doesn't stem from Hedges' work as much as the script. Erased often feels more like a public service announcement than a narrative movie, as Edgerton focuses more on the folly of "conversion therapy" than attempts to bring us an involving tale. Normally I'd appreciate a movie without excessive sentiment and melodrama, so it feels weird to wish a film came with more scenes of that sort. I just think Erased lacks the passion it needs to become more engrossing. I do like the movie's refusal to paint the heavily religious characters as cartoon Bible-thumpers - well, most of the time - and it allows us to see them as well-meaning but misguided. None of this makes me invested in the story or characters, as Erased comes across like a dry "coming of age" story. 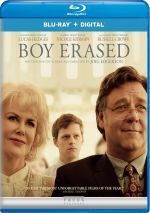 Boy Erased appears in an aspect ratio of approximately 1.85:1 on this Blu-ray Disc. The movie came with a good but not great presentation. Sharpness looked mostly positive. A little softness cropped up during occasional shots, but the majority of the film was fairly accurate and distinctive. I witnessed no shimmering or jaggies, and edge haloes remained absent. As expected, the film lacked any print flaws. In terms of palette, Erased went with a subdued take on orange and teal. Within the stylistic choices, the hues seemed fine. Blacks were deep and tight, and shadows looked smooth and clear for the most part, though some nighttime shots could be a little dim. Nothing about the image dazzled, but it seemed satisfactory. In addition, the movie’s DTS-HD MA 5.1 soundtrack suited the story, so this meant the soundscape accentuated general atmosphere and not much else. Outside of sports and party sequences, I couldn’t detect much that added particular dimensionality. The elements brought a little breadth but not much. Audio quality appeared good. Speech seemed distinctive and concise, without roughness or brittleness. Music was warm and full, and effects came across as accurate. This ended up as a serviceable mix for a character drama. As we head to extras, we get three featurettes, and we open with Jared Revealed. 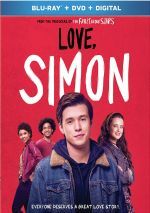 It fills three minutes, 10 seconds with comments from writer/actor/director Joel Edgerton, producer Kerry Kohansky-Roberts, author Garrard Conley, and actor Lucas Hedges. “Revealed” looks at the lead character and Hedges’ performance. With so little time at its disposal, “Revealed” becomes little more than promotional content. With Becoming the Eamons, we get a five-minute, 41-second reel with Edgerton, Conley, Hedges, and Kohansky-Roberts. “Becoming” gives us more cast/character information. It’s good to hear a little from the real “Jared”, but like “Revealed”, this one lacks much depth. Man Consumed lasts four minutes, 32 seconds and features Edgerton, Conley, Hedges, Kohansky-Roberts and actors Flea, David Joseph Craig and Troye Sivan. “Consumed” discusses Edgerton’s work on the film, and it brings us another mediocre overview. 23 Extended and Deleted Scenes take up a total of 32 minutes, 54 seconds. Some of these show more of the pressure Jared feels to be straight, and we get additional material with his high school girlfriend. Other clips offer basic expansions of some characters and themes. The elements related to Jared’s stabs at heterosexuality work best, but they’re unnecessary, as we already sense those issues in the final cut. The rest of the scenes also feel redundant for the most part. Don’t expect anything to stand out as important or necessary to tell the movie’s narrative. The disc opens with ads for Green Book, Collette, The Bookshop, What They Had and Operation Finale. No trailer for Erased appears here. Despite a reality-based story with enormous dramatic potential and an excellent cast, Boy Erased ends up as a surprisingly flat endeavor. Too much of it feels bloodless and without the necessary dynamic punch. The Blu-ray brings acceptable picture and audio along with supplements highlighted by a slew of deleted scenes. Erased tells a valuable tale in an overly detached manner.